After waking up throughout the night to itch what seemed like hundreds of bug bites, I felt rested and ready to hike into the North! About five miles in, we took a break to eat as a helicopter flew overhead. There was something hanging from it as it flew back and forth near the shelter. As we crossed the power line, we could see that it was some sort of device that was shaving off tree limbs along the power line. Or at least that’s what it looked like it was doing. It was another hot and humid day through Maryland and we passed several weekend hikers. At Warner Gap Hollow, we decided to soak our feet in the stream there. It felt so good to sit on the rocks and dip our feet into the cold water. I would love to do that every day if I could. We crossed Little Antietam Creek and then made the climb up to Raven Rock Cliffs. On our way down into Pen Mar Park, we hit a ton of rocks. I wondered if they were a precursor to the Pennsylvania rocks. We were excited to reach the park because we knew we only had a mile left after that. There were a lot of other hikers there and we sat on a bench for about a half hour watching a wedding party prepare for the ceremony, kids play on the playground, and families barbecuing under the pavilion. Medicine Man asked me to sign his walking stick, which many other thru-hikers had signed as well. We needed to resupply in the “other” Waynesboro (in PA) and we got a ride from the first car we saw. 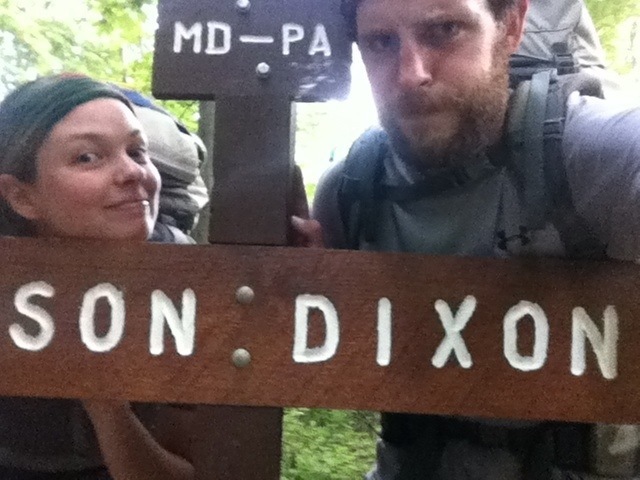 Josh gave us a ride to Food Lion and he told us about his section hike through part of Maryland with his fiancee. After a quick resupply, we walked over to Applebee’s for dinner. I had a burger and a strawberry lemonade and man was it tasty. I drink lemonade all summer, so I was excited to drink a couple of cold lemonades while in town. I was glued to the TV, even though Family Feud was on. One of the categories was, “Places where you hear panting.” What the heck kind of category is that?! I was ready to get back in the woods at that point. Again, we easily got a ride out of town. We rode in the back of the Livingston’s pick-up truck. There’s nothing like riding in the back of the truck on a hot day. 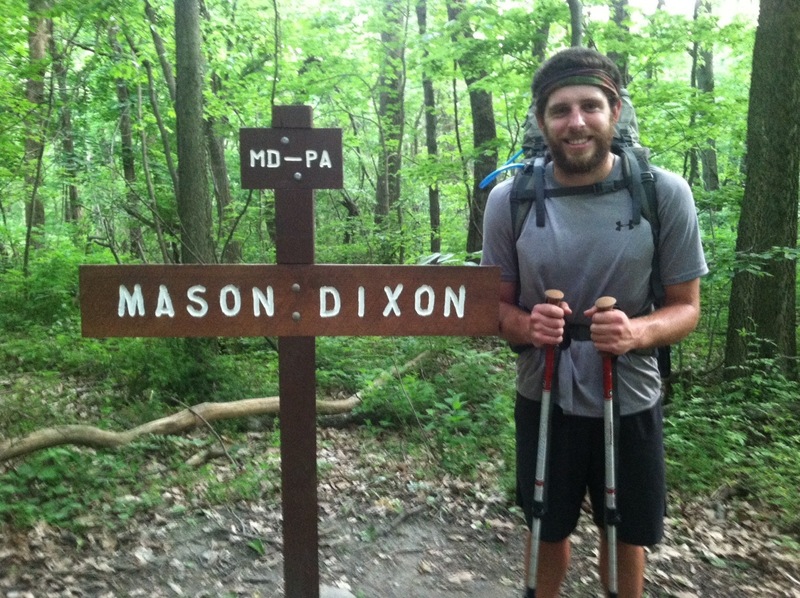 After filling up on water, we headed on past the park and across the Mason-Dixon Line into Pennsylvania! We are back in the North after 79 days in the South. Needless to say, we are excited to move on to what feels like the next chapter of our journey. We’re not home yet, but crossing that line for some reason made me feel a lot closer to home than we were just yesterday. 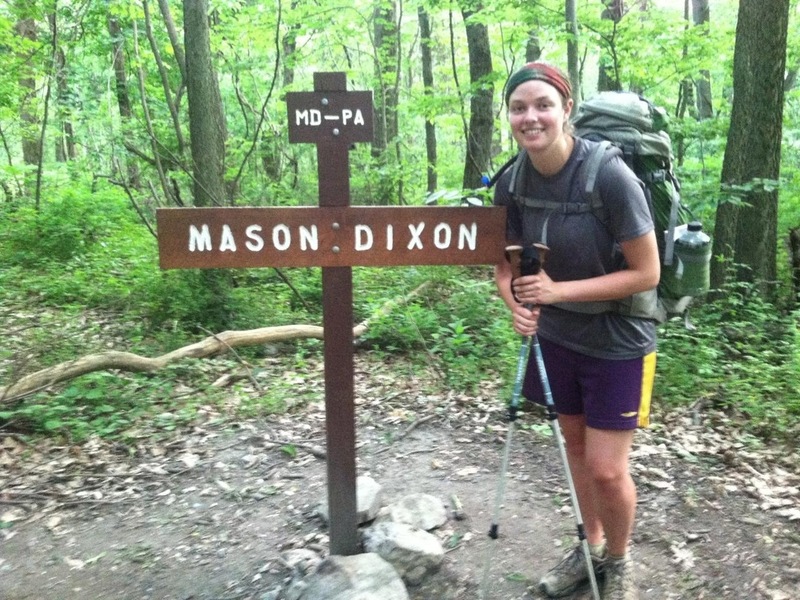 Next stop in two days: the midpoint of the AT! Since we are nearing the halfway point of our hike, I thought I would attempt to write a Q&A post. If you have any questions about our thru-hike, comment on this post with your question and I will answer your inquiry in my Q&A post within the next week. So if there’s anything that you’ve been curious about that I haven’t mentioned or if there’s something that you want to hear more about, ask away! Aside from food,what items of magic do you like best? Soda,fruit,candy or what? Hey guys. I’ve been following your journal for a while, just haven’t posted any comments. I really enjoy reading your post. I’m from PA and will probably be out hiking towards the end of this week, probably Thursday. I was wondering where you guys will be then. It would be fun to hike out and meet you guys and of course bring some trail magic 🙂 Congrats on making it to the North. Hey guys. My name is Danielle, I’ve been following your journal for a while, but this is my first attempt at poting a comment. I’m from PA and I’m planning on hiking on the AT this thursday and would enjoy meeting up with you guys. If this works for you guys let me know where you plan to be and/or camp thursday and if you are craving anything specific for trail magic 🙂 Congrats on making it to the north! I may have missed this already, but what are your hiker names and how did you pick them? How have you been avoiding the Poison Ivy?!?! I seem to get it at least once during the Spring and Summer? Hi!!! I’m curious about gear since we are hiking the trail 2014 🙂 I’m just curious if there are pieces of gear you dont’ use that you brought and gear you ended up having to buy because you realized you really wanted it as you hiked along? Congrats on making it half way through!!!! Yay PA (my home state)! I would also love to have a bit of a gear review from you guys. What items are you really really glad you brought along? What have you decided you can do without? Is there anything you maybe picked up along the way that you wish you had packed from the very beginning?